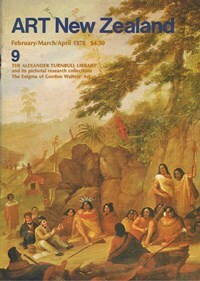 Among the difficulties encountered in New Zealand by anyone interested in the decorative arts is the quantity of beguiling books, monographs and magazines that are to be found on the shelves of bookshops. All too often these fall short of the expectations cleverly aroused by an attractive dust-jacket, and often beautiful coloured plates, and the reader finds himself the owner of yet another book with little real substance behind a handsome facade. With the release of the Penguin Dictionary of Decorative Arts this particular problem can be solved. Here at long last is a reference book that should be received by those interested in and seeking to be informed about all aspects of the decorative arts of the west. With over 1000 illustrations and about 4000 entries, this volume provides concise, explicit and clear definitions of terms and accounts of artistic movements and development from the Middle Ages to the present day. But this is no dry and technical volume designed only for the specialist and the expert: all with any interest at all in the decorative arts will find its range of subjects fabulous, and the sparse and intelligent writing compelling and illuminating. The illustrations are seemingly inexhaustible and amplify the writing in such a way as to make this beautifully-produced and easily-handled compendium of knowledge irresistible. Its moderate price enables it to be a 'must' for all interested in the fine arts.